Bright ruby black color. Fruity aromas and flavors of cherry mostarda, raspberry jam, plum tart, and toasted graham with a supple, crisp, dryish medium body and a smooth, breezy finish revealing nuances of smoked almonds and espresso- chocolate genache with crunchy tannins and a suggestion of oak flavor. An approachable and crowd-pleasing merlot. Bottom Line: An approachable and crowd-pleasing merlot. 86 • Bliss Family Vineyards 2016 Estate Bottled, Sauvignon Blanc, Mendocino 13.5% (USA) $14.00. 85 • Bliss Family Vineyards 2015 Estate Bottled, Chardonnay, Mendocino 13.5% (USA) $14.00. 86 • Bliss Family Vineyards 2016 Rosé Estate Bottled, Mendocino 13.5% (USA) $14.00. 91 • Bliss Family Vineyards 2015 Pinot Noir, Mendocino 13.5% (USA) $16.00. 87 • Bliss Family Vineyards 2014 Estate Bottled, Zinfandel, Mendocino 13.5% (USA) $14.00. 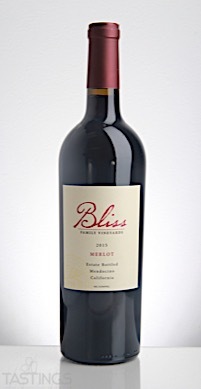 86 • Bliss Family Vineyards Blissful Red, Mendocino 13.5% (USA) $14.00. 85 • Bliss Family Vineyards 2015 Estate Bottled, Merlot, Mendocino 13.5% (USA) $.00. 91 • Bliss Family Vineyards 2015 Estate Bottled, Cabernet Sauvignon, Mendocino 13.5% (USA) $.00. 85 • Bliss Family Vineyards 2016 Estate Bottled, Chardonnay, Mendocino 13.5% (USA) $14.00. 94 • Brutocao 2015 Estate Bottled Hopland Ranches, Chardonnay, Mendocino 14.3% (USA) $18.00. 90 • Brutocao 2016 Estate Bottled Feliz Vineyard, Sauvignon Blanc, Mendocino 13.5% (USA) $16.00. 88 • Brutocao 2013 Estate Bottled Quadriga Hopland Ranches Red Blend, Mendocino 13.5% (USA) $26.00. 88 • Brutocao 2013 Estate Bottled Bliss Vineyard, Zinfandel, Mendocino 13.5% (USA) $26.00. 88 • Brutocao 2014 Torrent Hopland Ranches Red Wine, Mendocino 14.5% (USA) $.00. 89 • Brutocao 2014 Contento Vineyard, Cabernet Sauvignon, Mendocino 14.5% (USA) $.00. Merlot is a red variety that is loved by consumers, yet often shunned by certain wine gurus and critics, as they perceive these wines as “little sisters” to the more powerful Cabernet Sauvignon. Yet on its own, the best examples of Merlot are multi-layered, complex wines that are among the finest in the world. Merlot has many similar flavors to Cabernet Sauvignon, especially with its cherry and plum fruit, but is has fewer, less sharp tannins than Cabernet Sauvignon. Many producers whether in Bordeaux, America, Chile or elsewhere, often blend small percentages of Merlot into Cabernet Sauvignon to lessen the tannic bitterness of the latter. A few districts in France’s Bordeaux region, namely Pomerol, are home to the greatest examples of Merlot. Chateau Petrus is the world’s most famous example of Merlot, a powerful wine that ages beautifully for 30 or 40 years in the best vintages. There are also celebrated examples from American, especially in Washington’s Walla Walla valley as well as in Napa Valley in California. 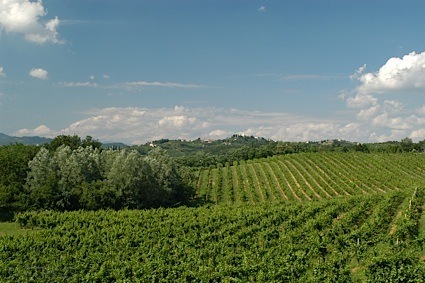 Merlot is also very successful in Chile, New Zealand and even in certain part of Italy. Merlot pairs best with foods such as lamb or veal, but it also sought out by consumers to accompany steaks and roast when they want a rounder, more elegant red wine. Bliss Family Vineyards 2015 Estate Bottled, Merlot, Mendocino rating was calculated by tastings.com to be 85 points out of 100 on 8/16/2017. Please note that MSRP may have changed since the date of our review.